Planning a party or corporate event is almost always a major challenge. You have to keep on top of details like invitations, guest lists, and coming up with a way to make your event unique while meeting your company’s goals and expectations for the event. But there may even be a bigger challenge, and that’s keeping your corporate event within budget. Whether you’re planning a large event or a small one, you need to get the most out of whatever resources you’ve been allocated. NY Party Works can help. We’ve been in the party planning business since 1993 and we’ve helped companies and organizations plan all types of events. We’ve also worked with different types of budgets, so we want to give you some tips on how you can keep your party within budget. The first thing to keep in mind is that you should know your budget before you start coming up with ideas and plans for the party, according to the personal finance blog, the Balance. They suggest that you itemize all of the categories you need including, finding a venue, catering, entertainment, decorations, lining up speakers for your event or any incidental fees that you know about. With an idea about how much you’re spending, you can look for packages. The management software company Capterra suggests looking for package deals. A package will always give you the best deal for your budget. Another way to save money is to cut down food packages. Have a buffet instead of a sit-down dinner. Consider having a cocktail hour instead of a full meal. Don’t give your guests expensive gifts to take home. Also note that even inexpensive swag can add up. Even if you’re using the event to get your brand and logo out there, carefully consider what you’re paying to give away. Make sure it’s useful to your guests. Entertainment is always one of the most memorable parts of the party. A package with a few different items is the way to go. Many packages are themed. Such as a sports package which can consist of pop-a-shot basketball games, virtual reality, pool tables, ping pong tables or any game tables. For an outdoor event you can do a package of inflatables such as the mechanical bull, obstacle courses, inflatable slides and bounce houses. Photo booths is a must have at any corporate event inside or out. NY Party Works can create a budget friendly package with custom logos or background plus put together a wide variety of props for your guests to use. A photo booth can also be packaged with another theme. NY Party Work can come up with some great packages to meet all budgets. 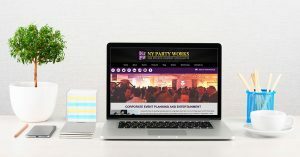 If you need help in all aspects of putting together your event, reach out to NY Party Works. We offer total event planning. We’ll work with you to find out what your goals are for the event, and yes, we’ll ask about your budget and find ways to make your party spectacular within your budget parameters. For more information, contact us today.